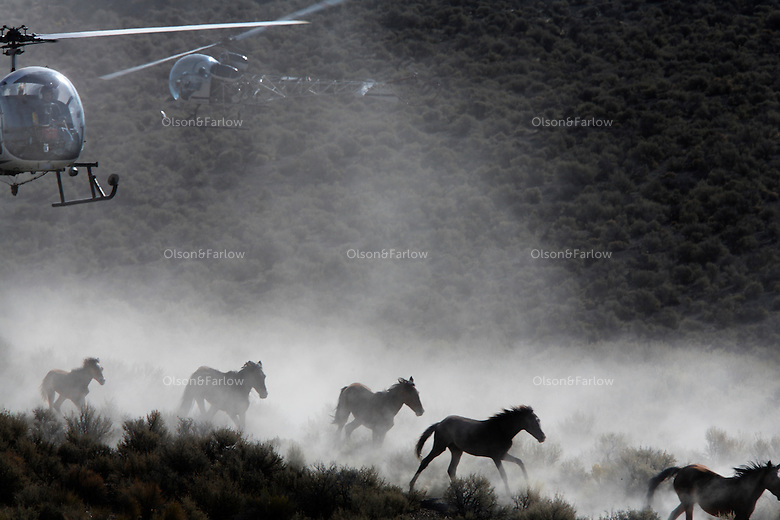 Dust rises from the dry rangeland as BLM contractors use two helicopters to gather almost 900 horses that have little food in the Nevada desert. Cattor Livestock Roundup Inc out of Nephi, Utah rounded up the horses that were shipped to Palomino Valley. Under the stress of malnutrition, dehydration and the changes in their environment and diet, some of the horses contracted salmonella, which complicated recovery efforts. Eventually 159 horses died, though others recovered from the sickness, and some never contracted the illness at all.